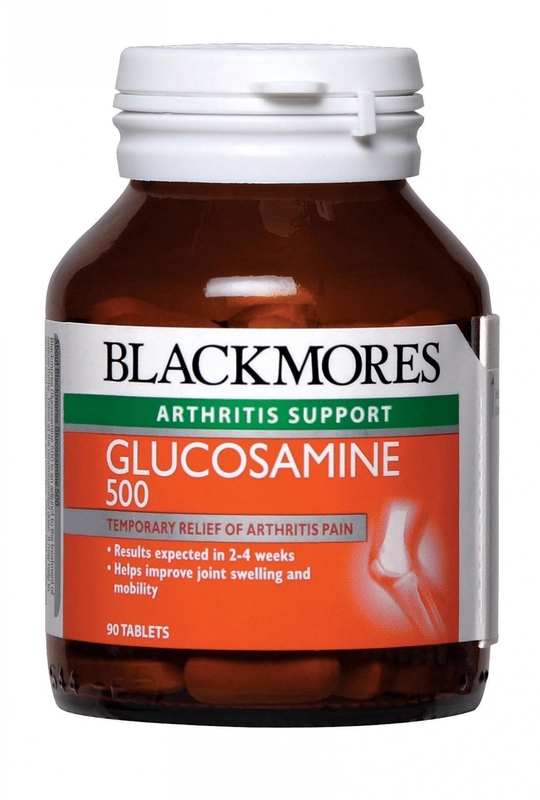 Blackmores Glucosamine 500 is an adjunct to the treatment of osteoarthritis. Taken at the recommended dose, it may help to reduce joint inflammation and swelling, improve joint mobility and provide temporary relief from the pain of osteoarthritis. Researchers found that there was a 50% improvement in pain and mobility after two weeks using glucosamine sulfate 500mg three times daily. Glucosamine and sulfate are natural components found in the cartilage matrix and synovial fluid. Glucosamine is a major building block of the substances that together with protein form the structural units in cartilage. These structural units, called aggrecans, are important for the elasticity, resilience and shock-absorbing properties of cartilage. Ageing decreases the body’s ability to restore and manufacture normal cartilage. Supplementary glucosamine can be an important source of this vital component of cartilage as we age. Glucosamine may help to provide relief from osteoarthritis symptoms, as well as helping to reduce cartilage wear and provide temporary relief of the pain associated with osteoarthritis. Researchers found in a clinical trial that patients with osteoarthritis of the knees had a clinically significant improvement in pain and mobility after a period of four weeks using glucosamine sulfate 500 mg three times daily.